Above: cyclists climb a hill on the B6349 road, in February 2014. Waren Mill and Budle Bay can be seen in the distance, with the distinctive Longstone Lighthouse behind (top centre). Bamburgh Castle is at the top right of the picture. Stunning photographs can be shot on clear winter days. The low sun picks out features and textures in the landscape and the muted colours are beautiful. A bike is an effective way to see the area, if you can handle the rolling hills. North Northumberland is easily accessible by road. The A1, London to Edinburgh road, passes through the region close to the east coast. This is the Great North Road. Though, since the 1970's, many of the villages that it used to travel through have been bypassed. 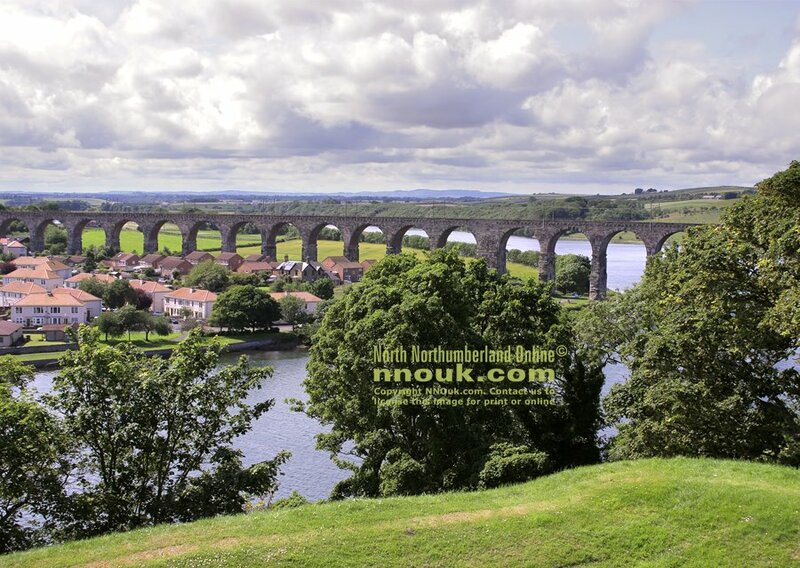 If you're on a cycle or scooter you may prefer to give the A1 a miss and travel between Alnwick and Berwick upon Tweed on the picturesque inland country roads or coastal route. Once you leave the A1 you'll find good roads that are surprisingly quiet even at the height of summer. 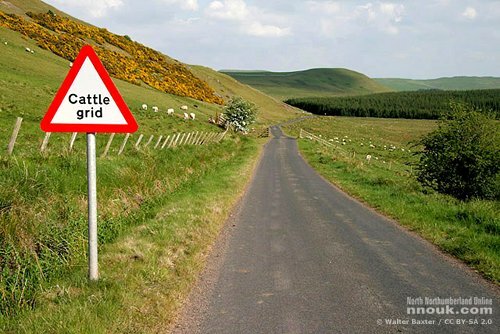 Visitors often comment on what a pleasure it is to travel around north Northumberland. Photo: © Walter Baxter / CC BY-SA 2.0. Although we try to keep this information about buses up-to-date, the timetables and sometimes the operators change every six months. 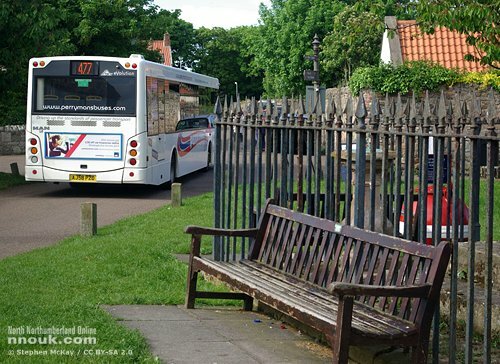 Bus services in the area are run by Arriva, Travelsure of Seahouses and Perryman's. The 505 and 515 Newcastle to Berwick Arriva services, which existed for many years, were renumbered a couple of years ago. The new X15 Arriva service runs between Newcastle upon Tyne and Berwick upon Tweed every two hours (weekdays and Saturdays), passing through Alnwick and Belford. This is a fairly direct bus that travels along the A1 mainly. An early evening view of Holy Island from the window of the X15 (former 505) bus. The new X18 service between Newcastle upon Tyne and Berwick upon Tweed is also operated by Arriva and runs every two hours on weekdays and Saturdays, less frequently on a Sunday. Travelsure operates its 418 weekday and Saturday services on the same route between Alnwick and Berwick. Between Alnwick and Belford these two services takes a longer but picturesque journey along the coast, passing through popular tourist spots such as Bamburgh, Seahouses, Beadnell, Embleton and Craster. This is a good way to see the coastline. The X15 doesn't run north of Alnwick on Sundays and Bank Holidays. There are slightly fewer services between October and May when the winter timetable comes into operation. The 477 service between Berwick and Holy Island is provided by Perryman's Buses with two return journies on Saturdays and Wednesdays only. For those who are travelling from the south, the 477 connects with the Arriva X15 and X18 services at Beal on the A1. The bus to Holy Island is governed by the safe crossing times, so the timetable varies daily according to the tides. The 477 bus in the Market Place on Holy Island. Photo: © Stephen McKay / CC BY-SA 2.0. There is no direct bus between Belford and Wooler. Passengers must go via Alnwick or Berwick. The 464 and 267 services between Berwick and Wooler are run by Perryman's Buses. The 470 and 473 services from Alnwick by PCL Travel. Bus services in the area are quite reliable, but because some cover a large distance they can be delayed due to roadworks, bad weather and school-children. They can be busy in the peak season and very hot on the sunniest summer days. On some routes there are no buses after 19.00 and on Sundays there is generally a much reduced service or none at all. Whenever you're travelling, we strongly recommend that you always plan out any journey in advance (to make sure you can get back) and check an up-to-date timetable. Ask the bus driver which is the best price ticket for your journey, as there are special deals. For instance, you can buy a one-day ticket that gives unlimited travel. A Travelsure Day Ticket costs £5.50, while Arriva offers its own Day Saver ticket. An Explorer North East ticket is valid for one day on buses run by Arriva North East, Go North East, Stagecoach North East, Travelsure, Weardale Motor Services, also on the Shields Ferry, Tyne and Wear Metro and on trains between Newcastle and Sunderland. It costs about £8.00 for an adult. By way of comparison, a standard single bus ticket between Berwick and Belford (a distance of 17 miles) costs £4.40. Taxis are available in the main towns and in some villages. In Berwick you can find them at the rail station and on the main street. The fare usually works out at around £1.50 per mile. The east coast railway line runs between London and Scotland. This service is one of the best in the UK and pleasant to use. Certainly a more enjoyable way to travel between Newcastle and Berwick than on the bus. A early evening southbound train arrives at Berwick upon Tweed. The rail journey takes less than half the time of the equivalent bus trip, but a standard ticket costs more than twice the price. 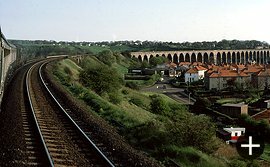 The main railway station in north Northumberland is at Berwick upon Tweed. Also there are stations at Alnmouth (near Alnwick) and at Chathill. However not all trains stop at these three locations, so you should check this before boarding elsewhere. The railway station at Chathill. Photos: © William Stafford (left), © Richard Rice (right) / CC BY-SA 2.0. Currently (March 2013) there are two trains a day from Newcastle to Chathill. These leave Newcastle at 05:55 and 17:38. In the opposite direction trains leave Chathill for Newcastle at 07:08 and 19:10. The journey time is about an hour. There is one viable service a day from Berwick upon Tweed to Chathill, at 06:00, and two from Chathill to Berwick at 07:10 and 18:36. For many years there has been a campaign to extend this service to Belford station (which closed in the late 1960's). But having been turned down in 2017 this now looks less likely to happen. There is also a longer-term campaign to reconnect Alnwick with Alnmouth. Central Station at Newcastle upon Tyne. If you're heading to Belford or to one of the villages around the coast, and you're able to fit in with the limited train times, a train to Chathill then a taxi to your final destination could be the best option. It may be quicker than taking a bus and could be cheaper too if part of a longer train journey and especially if more than one person is travelling and will share the taxi. Chathill is about six miles from Belford, two-and-a-half miles from Beadnell, three-and-a-half miles from Seahouses and four miles from Bamburgh. Cycles can be taken on many trains but sadly there may only be space for one or two and this may need to be booked in advance. It's important that you buy a ticket before boarding any train, unless it is impossible to purchase one at the station. Cheaper tickets can be had by booking in advance. At least a week or, preferably, fourteen days. East Coast is probably the best website for buying tickets online because, at the time of writing, it doesn't charge a fee for booking or payment by card. You can reduce the cost of your journey by buying several tickets instead of one. 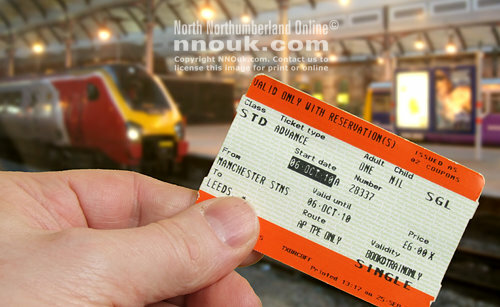 For example, buy a ticket for Manchester to Darlington and another for Darlington to Berwick. You may even be able to stay on the train if both tickets are for the same service, although you may have to move from one reserved seat to another. It's barmy that people have to do this to get the best deal, but you can save a substantial amount of money by doing so. The search facilities on the website make it relatively easy to find out the best stations at which to 'split' the journey and apparently it's all within the rules. A southbound Virgin train crosses the Royal Border Bridge at Berwick. Rover, Ranger and Round Robin tickets are also worth looking into. For an adult fare of £88 the North-east Rover gives you unlimited off-peak travel for either seven consecutive days or any four days in a consecutive eight day period. The North East Rover covers the area from Berwick upon Tweed in the north to Sheffield and Retford in the south and from Carlisle, Halifax and Huddersfield in the west to Whitby, Scarborough, Hull and Cleethorpes in the east. It also includes the Settle and Carlisle line. Book your summer holiday with Dorset Coastal Cottages. For the best scenic views when travelling north, sit on the right-hand side of the train (facing the direction of travel). About 20 minutes after leaving Newcastle, the pretty village of Alnmouth, with its distinctive pastel-coloured houses, can be seen on the headland above a bay. On the left, 10 minutes later, Belford appears on a hill in the distance. But, as the train thunders past, most travellers will be too busy looking out for a glimpse of Holy Island. It appears soon after, on the right. 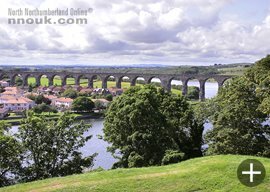 The 28 semi-circular arches of the Royal Border Bridge (built 150 years ago) carry the train high above the River Tweed and into Berwick, with a spectacular view of the town. Onboard a northbound train as it approaches the magnificent Royal Border Bridge over the River Tweed. Photo: © Martin Addison / CC BY-SA 2.0.